If you’re like me, the concept of sales or ‘selling’ conjures images of greasy salesman with fake gold teeth, or your neighbor pestering you with some shady pyramid scheme for products that nobody really uses. So when it comes to selling your own services or products, although you may greatly believe in them and have glowing reviews to back them up, it can still be nerve wracking when it comes to convincing others through ‘selling’. But here’s the deal: you shouldn’t have to convince anybody about your offers. The key to selling is to inspire people by connecting with them on a deeper level, so much so that it’s not even about the actual product or service, but about how it will change their lives. My guest today is a wonderful person who shows up in the world as her authentic, sweet, and kind self. Nikki Rausch is an author and sales coach who has a unique ability to transform selling and change it from being pushy or salesy to gentle and authentic. Selling, sometimes it’s hard for me. Even though I have incredible case studies with my clients–like for example I helped this woman stop smoking after two sessions of working with me, and she was smoking for 20 years. I’m not even an addiction specialist, I just have the right tools to help people break through their patterns and I guess it works. I help my clients succeed and they go on in life, they get more confident, they feel amazing, they attract their soul mate and yet every time it comes to a sales conversation, even though I studied that topic and I have sales scripts and people told me what to do, there is still some kind of a, “I don’t want to be sleazy and I want them to love me,” and I still give a lot of information for free. If you’re struggling with sales like me, or if you want to just improve your sales strategies, today’s session is for you. I met my guest at an event called BizChix Live. BizChix is a podcast that I love to listen to. If you’re a woman entrepreneur, listen to BizChix podcast because it’s a very good podcast. I listened to the podcast, I went to the live event and one of the speakers was Nikki. She is the founder and CEO of Sales Maven, an organization dedicated to authentic selling. Nikki Rausch has a unique ability to transform the misunderstood process of selling. She really reframed selling for me and she changes it from being pushy, or salesy to really help you do it in a form of invitation, in this very gentle way of authenticity. Nikki’s popular books are available in Amazon, Buying Signals: How to Spot the Green Light and Increase Sales and Six-Word Lessons on Influencing with Grace. Excellent resources for those who are unable to attend her live speaking engagement, coaching programs, or workshops. She’s such a joy. Really, she is full of energy and she’s one of those people that’s a really good person, and she’s really kind. She walks her talk with the way she shows up in the world in her authentic, sweet, and kind self. Now without further ado, onto the show. Hi Nikki and welcome to Stellar Life Podcast. Thank you for having me, I’m excited to be here with you today. I’m super excited. I only met you recently and I just loved your personality and I loved what I learned from you. We were together at BizChix Live and you were on stage sharing your way of selling which I found very intriguing, very of the feminine, and very uniquely you. I love that. We’re going to dive into sales and your methodology of selling, but before we start, why don’t you tell us a little bit about yourself? Okay, thank you. I have 25 years of sales experience, a good majority of those was selling in the technology space. I started my own company five years ago. In addition to having an extensive background in sales, I also am a master certified practitioner of neuro linguistic programming. When I started my business, it really was out of meeting all of these really cool entrepreneurs that were doing amazing things, that were extremely passionate about their product or their service, and yet I found that they were really struggling to make money because they didn’t understand the selling process, or somebody had told them how to sell in some certain way that didn’t fit with their style. My business was really born out of wanting to teach people that you can be your authentic self. Once you understand the selling process, you can be effective at it and still feel like you’re being you, you’re not trying to sell like somebody else, or be pushy or aggressive. I really combine my sales experience with my background in neuro linguistic programming. By the way, if that’s a new term to anybody listening, it’s essentially the study of communication. The way we process information in our brains, the way that we communicate, the language piece, and then programming. The programming part of NLP is about habits and patterns. When you can recognize how you show up in a room, or how you show up in a conversation, you can also start to recognize how another person shows up. When you can adjust and be flexible in your own behavior to put the other person at ease, the selling process gets so much easier. Yes. Most people don’t like the idea of being sold to. So you’re right, the first and the foundation of everything I do is about rapport. If you don’t have rapport, you pretty much are not going to get the business. One of the easiest ways to build rapport with somebody is to pay attention to that person’s rate of speech. The reason I say that is because we like people who are like us and we also think people who are like us are smart. If you meet somebody who’s like you, who speaks like you, you’re like, “That person is smart. I like that person,” you got it going on. It’s actually really difficult to stay in a conversation with somebody who has a significantly different rate of speech than you. If you’re somebody, if you think about a spectrum like zero to 10 and if you’re somebody who tends to take your time in your speech pattern, that’s perfect by the way, and you meet somebody who talks really fast, they kind of talk over you and sometimes interrupt you, it’s hard to stay in conversation with that person. When you can pay attention to somebody’s rate of speech and be willing to either speed up a little bit or slow down a little bit, you make it easier for them to stay in conversation. When it’s easy to be in conversation, they’re much more likely to listen to what you have to say and more importantly, they’re much more likely to share with you about what their wants and needs are, and how you can meet those wants and needs. Yeah. It’s so cool. I started taking Improv classes because I just love it. I go and I play like a kid for a few hours and I forget about the world, and I can be as funny, and goofy, and big, and crazy, and silly and nobody cares. It’s so fun. We did this exercise yesterday where it was four of us in a car, it starts with one personality and everybody that is in the car is basically being the same type of person. If the person in the car is super angry, then everybody in the car is going to be really angry. Then there is another hitchhiker coming in and is coming with a different energy, he comes in like, “Oh my god, I just lost my husband,” and everybody in the car starts to like, grieve. And then somebody comes and is like, “Yo man, can you give me a ride?” and everybody in the car starts to be like that. It was so much fun to be in that rapport to be honest. That’s a perfect example of that. It is so cool and the moment you mirror somebody and you match their physiology, and you match their cadence, the rhythm of their speech, and you match the way their facial expression and their energy. I feel like it’s easier in person, but as you develop your sensitivity, you can also do it on the phone. You can really feel it through the way they speak. When you embrace that and you embrace the way they speak, then you can also understand them better. You almost embody who they are so you can get them. That is 100% true and there’s been studies around the brain that when you take on somebody’s mannerisms, and you take on facial expressions like everything that they’re doing, it actually fires different parts of your brain. You do start to think a little differently. It allows again, for you to be more flexible. You’re right, in person is the best because you can see their facial expressions, you can hear their tone of voice, they’ve got all of your communication and all of theirs that you can adjust and match and mirror to. On the phone, you can certainly do that as well. There is actually a little tip on how to do it in email because in an email you strip away all the facial expressions, the body language, and the voice quality. In email, if you pay attention to the way somebody sends you an email, you can kind of match and mirror that a little bit as well. If you ask somebody a question and there is somebody who sends you back a really long thought out answer, they are not the kind of person that you can then send them back an answer to their question as yes or no. They want a little more from you. The opposite is true too. If you’re somebody who likes to write out really long explanations about something and you ask somebody a question, a prospect a question, or client a question and their response is yes, they don’t want these really long responses from you. In person communication is the best because you can see their facial expressions, hear their tone of voice, and observe their body language. Right. I just started working with a new business coach and he is extraordinary. He is super high level and super busy and his answers are quite short. My first email to him was quite long. I was explaining and talking, and then he answered in short words. My answers got shorter and shorter that now it’s like, yes/no and the shorter my answers get, the longer his answers get. It’s kind of interesting. That’s what happens when you learn how to adjust to somebody else. What happens is it sends the signal like, “This person is willing to be flexible to me. I can then be a little flexible too,” this is why even if you’re just matching somebody’s rate of speech to let’s say you’re maybe a four as far as the rate of speech goes and you have somebody who’s a 10 or they talk really fast. If you’ll speed up to a six or maybe a seven, they will start to slow down a little bit. We want to be in sync with the other person. It takes less energy to be in sync with somebody in a conversation. I’m not surprised that he’s starting to make some adjustments to you because you’ve shown him that you’ll be flexible and adjust to him first. Yeah, that’s wonderful. This is so insightful. I love it. Before we dive deeper into the selling process, I want to talk about the fear of selling. Why are people afraid of selling and how can they reframe it? Wow, that’s a great question. I think one of the biggest reasons why people are afraid of selling is because they’re too focused on themselves. They’re worried about what the other person is going to think of them, or how the other person is going to interpret what they’re doing. I would say relationship selling isn’t about you as the seller, it’s actually about the client. When you take that pressure off of yourself and you start to do everything you can to put the other person at ease and everything you can to make the experience phenomenal for them, it actually takes the pressure off and allows for you to just focus on the other person and then you can’t really be caught up in your own head about, “Are they going to think I’m being pushy, or aggressive, or salesy, or do they hate me, or do they not want to buy from me?” you’re not even worried about those things anymore because you’re just worried about them having a really great experience. Your job is to build rapport and make it easy for them to be in conversation with you. I know a guy named Anil Gupta and he is a coach extraordinaire. He talks about happiness, he’s best friends with Richard Branson. They play tennis together. I remember a few years ago, we met, he had to stay in his summer house in Florida. We met him there and I started talking to him about my fears of coaching, my fears of English as my second language and that I’m not good enough. He just looked at me and said, “If you’re not going to step up, somebody’s going to die,” and you know how somebody says something in a way that really resonates. I think that is a really powerful message and I agree. In the selling process, I will say one of the biggest things that I teach people is how it’s your job to invite people to do business with you. When you don’t invite people to do business with you, those people miss out on having life changing experiences. I get really lucky and the people that I work with have really positive missions. They want to change the world. They want to make a good, positive impacts with the people they come into contact with. When they get caught up in their head and they’re not willing to walk somebody through the selling process, people are really missing out. They’re struggling with something, or something that will make their life either happier or better in some way, and when you are not willing to put yourself out there and walk somebody through the selling process, your prospective clients are missing out on life changing opportunities. Sometimes life changing depending on who’s listening to this. They might say, “I just sell this. I just sell that. It doesn’t really matter,” but it does matter because if it make somebody’s life better, or happier, or just relieves some type of stress for them, those are life changing things that add up. Yeah. People tend to do that. They don’t see the value in what they do. They’re like, “I’m just selling this little thing, how can this change the world?” or “I’m just helping this person, how can that change the world?” Well, if you help somebody that helps somebody to do something great or like you said, we really need to celebrate our achievements and everything that we do in life and all the great things that we do. Sometimes we walk around with that nagging feeling of, “I’m not enough. I’m not doing enough. I need to do more because I need to do more,” and when you acknowledge that what you do is enough, and you are perfect just the way you are, and you’re doing the best you can with what you got, and there is the self acceptance, that’s a launching pad. That’s a place for you to evolve, but when you beat yourself up about not doing enough, it’s stagnant and makes you stand still. Yeah, I agree. It really is about being willing to step outside of your comfort zone just a little bit. It doesn’t have to be where your voice shakes and you feel like you’re about to come to tears. Actually, one of the things I love is when I work with somebody and I have one woman in particular who actually was at BizChix. When we started working together, her number one thing that she was looking for to get out of working with me was to feel confident in the selling process. We’ve only been working together for a few short months and at BizChix, she came up to me the last night and we had a private conversation and she was sharing with me that she feels so confident now when she’s talking about her service and what she offers and that she has such a better understanding of where she is in the process in a conversation with somebody. I wish I had a video of her confidence level where we started and when she was talking about sales, or how she came across that night, that last night at BizChix, her level of confidence was unbelievable. If people have witnessed that, you would say, “This woman is unstoppable and she is making a difference in the world,” and you could tell she felt it. It wasn’t that she was trying to manipulate anybody, or do anything that is underhanded in any way, she just had such a sense of confidence about herself that it almost brought me to tears. It was so special to watch her in that moment and feel such a sense of confidence about herself, and what she does, and the impact that she’s making on the world. When you acknowledge that what you do is enough and you are perfect just the way you are, that’s a launching pad. Right. If you did not do that sale, if you weren’t proficient at selling, then this would never happen and she would probably go on for a few more years trying to figure it out, and not feeling confident, and not shining. It’s a ripple effect, because the moment someone feels confident, then other areas of their life change. She probably shows up differently too for her husband, or her kids, or anybody she comes in contact with. That is true. I hear that a lot. When people work with me, they often will say that their relationships with their teenagers have improved, or their relationship with their family members have improved. Well one, I focus on the communication side of sales, the relationship side, the words that you choose, the way that you behave. All of that is translatable into every other area and relationship in your life. That is a super satisfying experience. I had a woman one time tell me that she had gone to her family’s reunion and she said, “This is the best family reunion I’ve ever been to,” and when I asked her why, she was like, “Well, I have all these new skills. When I’m in a conversation with somebody and I understand where we are in the conversation. I feel so much more confident. I know how to gracefully exit a conversation that doesn’t serve me,” all these things I think we all are striving for. Let’s start from the beginning. You meet someone at a networking event. I love what you said on stage which was, “This is not a sale, this is an invitation,” and for me it was like hallelujah, light bulb. Great. This is amazing. I love inviting people to all kinds of things. This is so much easier now that I have this distinction, it is not a sale, it’s an invitation. When you meet somebody in a networking environment, how do you prepare yourself? What intention do you hold for the networking event and how do you invite people? So specifically around networking, I always employ and I teach this technique too as well. I call it 3-2-1 of Networking. The idea is if I’m going into a networking meeting, and it doesn’t matter if there’s a thousand people in the room or if there are 20 people in the room. My intention is to the first three, build rapport with three new people in the room. So that means my job is to meet and connect on a real level with three people. So it’s not just, “Hi, I’m Nikki. here’s my business card,” it’s really getting to know a little bit about that person, what brought them there, asking them questions to tell me a little bit about their business, or anything that they want to share. That’s the three part of it. The two part is to always deepen rapport with two people in the room that I already know, because I do know that sometimes the selling process takes time and people have what’s known as commits or strategies. They’ll have to meet you a few times, or connect with you a few times before they’re even interested in hearing how you might be able to serve them, or be a resource to them in some way. So that’s the two part of it, is connect with two people in the room at a deeper level that I’ve already met before. Then the one is to always invite a minimum of one person to connect outside of the networking event. That means I’m looking for people who are possibly prospective clients. That comes from in the networking meeting. One of the things that I teach this and I do this as well is I’m always looking for ways to create curiosity. I know that if I create curiosity, people are going to ask me questions. If people start asking me questions, I then am on the lookout for buying signals. Buying signals are indicators that somebody would like more information. It could be that they’re interested in actually buying or hiring me. A lot of times though, it just means they’re interested in going to the next step in the selling process. So then my job is to invite them to schedule a time to talk about it outside of the networking. I will never be the person who says, “Here’s my business card, call me. Can I have your business card, I will call you,” I always issue an invitation in that moment to schedule a time right then on our calendars, because I know that if I get on somebody’s calendar and they get on mine, we’re much more likely to have a conversation that will progress us down to the next step in the selling process versus saying, “Here’s my business card. Here’s my website, check it out,” I know people don’t do that. I don’t do it. I know that if I’m on somebody’s calendar and I call them, just like you and I scheduled this morning to talk. Had we not been on our calendars, the chance of this happening would have probably been slim to none. Correct. That’s such a wonderful tip. I arrived to the US about 16 years ago. I was younger and kind of wild. Then I became more into business and finding who I was in the business world as a business owner. Networking was a new thing. I feel like so many people are missing the ABC of networking and they’re missing opportunities because of that. It’s a learned skill. It is a learned skill. It definitely is. When you do it with the intention of building rapport versus trying to get business out of somebody, it takes the pressure off of you as the person who feels like you have to sell to people, and it allows for real relationships to develop and unfold. Networking is a little bit of a long game. You have to be willing to, one, find the right group for you. I would say find your people. Find people who are doing business together because the best networking groups are where they’re supporting each other and they’re actually doing business together. The other side of networking sometimes can be—and we have a group here in Washington that every time I ask somebody, “Have you gotten any business from that group?” they always say no. To me that group is, I call it Ladies Who Lunch. I don’t mean that just for women, if you’re just going to an event to have lunch with people, or to have a meal with people, that’s totally fine. I don’t consider that a work opportunity. If people aren’t doing business there, then it’s fine if you’re counting that as a social gathering, but it’s not something that’s going to build business for you. So actually today, I’m going to a networking event. It’s an eWomen event. I’m not a member of that chapter. I’m kind of a guest. I offered to give as a gift two alter ego mapping sessions and because I’m giving a gift, they’re going to allow me to speak about my business for 30 seconds. Do you have any tips for those 30 seconds? I do. I think it’s really important that you talk about in those 30 seconds who hires you. A lot of people will say who they help. Instead, say who hires you. Say, “Women who need blah, blah hire me to do blah, blah,” whatever that is. Instead of saying, “I help women,” because you sound like everybody else when you do that. No, I hate that. Everybody else has the same freaking formula. So what’s your “formula” so how do you start if you have to do that for you. It’s really important that you talk about in those 30 seconds who hires you. A lot of people will say who they help. Instead, say who hires you. Oh my god, that is so perfect and professional. I freaking love it. I need to practice that. Can we practice it for a moment right now? First of all, who you are and what you do. Hi, my name is Orion Talmay. I am the founder of Orion’s Method and the host of the popular podcast Stellar Life. And then what? Women who hire me? Yes, now say who hires you and what they hire you for. How did you say it? What was the structure? Oh yeah, it’s the same. Women entrepreneurs hire me to, you see I want to say help them. To learn how to tap into their feminine genius so they can increase more of their power and have more success in business, life, and love. Okay. so for example, I was just got invited to my client’s wedding and she got married within a year of working together and she said she was waiting for this love for over 50 years, for a love like that. Oh my gosh, I just got the chills. That’s a great example of somebody who’s been waiting 50 years. Did you say 50? Fifty, that’s what she said. I didn’t, it was my birthday. I couldn’t. Yeah. This was just brilliant. You’re amazing. Let’s go back to the selling. You said you had a real connection with three people. You deepen your connection with two people. You invited at least one person to connect outside of the networking event, and then what? What do you do in the sales process when you invite somebody? Do you have a question here that you send to them ahead of time? Do you just talk to them first? Well, I’m going to pay attention to that conversation. Let’s say that somebody actually expressed interest in working with me. That’s why I invited them to the next step. Maybe they’re like, “I could really use some help with sales. Can we talk about ways that we would work together?” It might not make sense to have that conversation right then in that networking meeting so that’s why I would schedule a time for us to talk. Maybe tomorrow or the next day, but I would actually get it on my calendar so that when I call them, they answer. I’m going to preframe at the beginning. I call it pre framing but it’s really setting the stage of the call at the beginning. It’s important in the sales process that you take the lead at this point in the discovery and say, “It was so great to meet you at that event the other day and the purpose of our call today was to talk about ways that I might be a resource to you. I have a schedule to talk for about…” and I’m going to say how long like, “…20 to 30 minutes. Does that fit in your schedule?” because I’m trying to be sure that I’m being very respectful of the person and their time. One of the most important things you want to do in the discovery process is create safety for the other person. Even though you might feel nervous about, “Maybe I’m going into the selling thing,” the other person feels nervous because they’re thinking, “Nikki might try to sell to me and I don’t know if I can afford her,” we don’t know what’s going through their minds. Do everything you can to put them at ease. Talk about how long you’re going to be, how long the call’s going to be. Then I always say, “In order for this meeting to be meaningful and productive for you, I’d like to start with a couple of quick questions. Is that okay?” Then I wait for them to give me permission. A lot of times, people will just jump in and they’ll start saying, “Let’s talk about ways we can work together,” and they’ll start selling. If you start selling too soon, you can turn people off because at this point, you may not actually know what they need and it’s hard for you to then recommend the right solution for them because you haven’t asked the right questions. I do have very specific questions that I ask in that process and here’s a little tip, I find that sometimes in the discovery process, it’s interesting. I’m going to teach a little live training about this later this week about the number one mistake people make in the discovery process. The number one mistake is that we ask people questions that we don’t need the answers to and until they hire us. The questions that you should be asking in the discovery process should actually lead to people hiring you, not the questions that you need to ask them once they’ve hired you. I will never ask somebody like, “What’s your revenue this year and how close are you to meeting your goal?” because I don’t need to know that in the discovery process. I only need to know that after you’ve hired me. I won’t ask you to tell me what your 30-second elevator pitch is in the discovery process because I don’t need to know that until after you’ve hired me. I only ask questions in the discovery process that lead to hiring me. I will ask questions like, “How confident are you in being able to create curiosity about what you do in your business?” Because I teach creating curiosity and how to do it. If somebody says, “Not very good,” well, that’s something that I can help them with. How often do you tell stories to demonstrate a point or help move people into action, because I teach storytelling as part of the selling process, but I don’t need to know what their stories are until after they hire me. Does that make sense? Yeah, it makes sense. Of course. Yeah. For people who are doing consultations or discoveries, make sure that you are asking questions that lead to hiring you. I always say, “All roads have to lead to hiring you,” and if you’re asking questions that you would need to know the answers to once they’ve hired you, you’re wasting precious time and precious questions during the discovery process. I had this recently with a client of mine. She hired me because she was stumbling through the discovery process. What we found was just by me asking her a couple of quick questions, I found that she was asking people to show up to the discovery with all kinds of information like financial information, personal information. She was expecting them and she was sending them a list ahead of time of all this documentation that they needed to bring to the discovery call. When I challenged her about that, “Why are you asking for this information? how is this serving you in the discovery?” She’s like, “Well, once I start working with them, I need to know all of that,” I’m like, “Agreed, and they haven’t hired you yet and you’re asking them to jump through a bunch of hoops and have to gather all of this data. This is why people aren’t going through the discovery process with you. You’re asking too much of them. We changed her discovery process and now she is saying to me she’s like, “Nikki, my discoveries are going so much better and I can actually determine quicker if somebody is an ideal client or not. I’m not wasting their time, they’re not wasting mine when I can find out clearly like they’re not even an ideal client for me. That is so powerful. You’re changing lives. I want to circle back to the buying signals. What are buying signals? How do you know somebody wants to even have the discovery session? A buying signal is a verbal or nonverbal cue that somebody gives that indicates interest. I actually wrote a book about buying, it’s called Buying Signals. In there, I list 17. Here’s one of the most missed buying signals. I actually say this is the most missed buying signal. If somebody comes up to you and they give you a compliment about your work, about your company, about what you do, that is a potential buying signal. When you get a buying signal, the most important thing that you can do in the moment is invite somebody to the next step. An example of this is a woman came up to me one time–at a networking event by the way since we’re talking about networking–and she said, “Are you Nikki Rausch?” and I said, “I am,” because I am. She said, “My friend, she went through your course and she just raved about it,” I hear that as a buying signal. That’s a compliment, I love a compliment. I said, “Oh, thank you so much. I enjoyed your friend so much, we had such a great time,” and then I say, “Is there something I might be able to help you with?” Because I have to issue an invitation and I’m checking to see. Maybe she just really came over to say hi and she could have very well said like, “No, I just wanted to meet you,” and I would’ve been totally fine with that. But if I don’t invite her to see if there’s some way that I can help her, then she might leave feeling unsatisfied with that conversation. The last thing I ever want anybody to feel with me is unsatisfied. She thought about it for a minute and she said, “I don’t know, maybe,” I said, “Great. What do you think about scheduling a time on our calendars just to get to know each other better and find out a little bit more about your business?” And so she said yes, we scheduled a time. We had a great conversation. I tell this story about this conversation like, “Are you Nikki Rausch, blah, blah, blah,” and she goes, “Is that story about me?” and I said, “It is about you. Do you remember coming up to me at that networking event?” she’s like, “I remember it so clearly. I said, “How did we get here? Did you come up to me that morning with the idea that you are just going to hand me thousands of dollars?” and she was like, “Heck no,” “How did we get here? How did we get to work together?” and she said, “Nikki, you asked,” and that’s the point. Just ask. It’s just an invitation. I know I talked about this on stage at BizChix. I want to tell you what happened to me after you spoke on stage at BizChix. Sometimes I’m shy. I am a shy person. I’m a very complex personality. I can be very much an extrovert but I also have this introvert part of me when I’m in a crowd for a while, I’ll have to take a step back and just breathe by myself. I’ll be shy to invite people to work with me. After your talk, I spoke to this lady. I approached this table and started talking to these ladies. I got the strongest buying signal I’ve ever gotten in my life. I just told these woman what I do and she started crying. I wanted to just hug her at that moment and just, “It’s going to be okay,” I followed your advice and we made a joke out of it. I was like, “Well, can I make an invitation?” it was just right after your talk and we both knew what it was about and we were laughing about it and we have a call in two weeks. That was great. I think if that happened before, I would just stand there and just start giving her everything that I got to try to soothe her. Which is never enough, because you never can coach somebody in five minutes. Yeah, you can say something that might change the trajectory of their lives, but you really need to work with them. Whatever change is happening, whatever new belief is born, can grow and be a part of them. A one minute quick fix is like a Band-Aid, the wound is still there, you need time to go deeper and really help heal that person. Yes. Well one, congratulations on issuing an invitation. I’m really proud of you. I’m proud of me too. You should be. I know you’ll make a difference in her life and what you said was so profound. I do talk about this with clients all the time, this idea of beware of doing this 5-minute coach, coaching or giving somebody something, because you know from all of your years of experience and everything that you bring to the work that you do that you’ve got so much more than that little 5-minute response to soothe somebody. Yet for them, it may feel like you just handed them the world but you know that you really just handed them one grain of sand and there’s a whole beach left for them to discover and enjoy and that only comes from working with you. Yeah. They feel satisfied in the moment. They’re like, “Okay, I’m good. Everything is good,” good is never good enough. You want to bring them to a place of exquisite excellence. Oh my god. I’m going to buy this domain right now, exquisite excellence. It is a good one, who doesn’t want that. I love that you get that and that you talk about that and that you know that you cannot just give somebody, because for you it might feel like a throw away, it might feel like it’s not a big deal. For them, it might feel like a huge deal, but yet it is not enough. They need more. Yeah, they do need more. We talked about the buying signals, we talked about the questions. How do you incorporate NLP into your selling process. We talked about rapport which is a part of NLP but what other techniques do you use to influence people? I would say there’s a myriad of other techniques. Some of the more popular ones that I teach. I do teach matching and mirroring which has to do with matching rate of speech and there’s more that goes into that. I teach something that’s known as psycho geography and it’s a little hard to explain without experiencing it. It’s essentially like where you stand or sit and what you do with your body to create a connection with another person. That’s a really important part. Then I teach a lot around language. It’s not just what you say, it’s how you say it and what words you use in certain instances. Language is very much a big part of the work that I do and that comes from my NLP background. Some people think that it might be, “I can’t believe you’re using those language patterns to influence people,” but you can influence somebody for good or you can influence somebody to do something bad. It’s like having money, you can have money and buy bombs or you can have money and buy schools and hospitals. Yes. It is one of those. Understanding NLP is actually good for everybody because one, sometimes I actually do teach certain techniques and I’ll say it now, consumer protection for your own mind. When you are in the position of it’s your money on the line, when you’re the client or you’re the prospect, you want to pay attention to certain cues so that you’re making sure that you are making decisions not based on the energy that this person has created and this connection that they’ve created, but it’s based on what’s best for you. I often do talk about please use this technique with a high level of integrity because it can be very influential. You’re right, you can use it to manipulate and be negative. I hope none of the people that I teach do that. I don’t think that they do. You can also use it to again put the other person at ease. Allow for them to enjoy the conversation with you and the experience with you. Please deliver with a high level of expertise. Do your best work to make a difference in the lives of your clients. I think that’s really important. My favorite quote of all time which to me is a good representation of NLP is, “Blessed are the flexible for they shall not be bent out of shape.” I’m always going for flexibility because I know that the person who has the most flexibility in a conversation has the most influence. I love it. Amazing. You have a flexible composition with your client and then how do you move them into action, into taking out their credit card and start to work with you? Once you’ve gone through the discovery process and you have determined that there are things that you know that you could be of service to this person, you have a product or a service that would benefit, meet their needs, solve a problem, help them overcome a struggle, the next step is to check to see if they’re interested in learning more. I rarely just launch into like, “Here’s the ways we can work together,” I’m probably going to chat with that so with that person and say, “Based on this conversation, I already have some ideas,” and sometimes I give a specific number because I take notes when I’m in those conversations and I write down things for me. I can look at my notes and say, “Based on our conversation so far, I can already see six specific areas that we might work together. Is that something you’d be interested in learning more about?” because I’m waiting for them to give me permission of a yes. Once they say yes, then I’m going to recommend up to three ways that we might work together. Even though I have more than three ways for people to work with me, it’s my job to narrow down and recommend the three most likely and best solutions for this person. So based on what I’ve learned I’m going to recommend three options for them. Once I’ve laid out the three options, and if you only have one way or two ways to work with you, that’s totally fine too. If there’s really only one way that makes sense based on their need, then only recommend the one way. Then I’m going to say, “Here’s my recommendation. It’s that we would work together privately in a one-on-one session, here’s what that entails. Based on that option, is that something you’re interested in?” this is me now issuing another invitation and I’m asking them, yes or no. If they say yes, then I’m going to talk about the next best step. The answer is yes, great, “So the next step is for us to schedule your VIP day and let’s look at our calendars and get that on the calendar now.” And then a lot of times, I’ve actually been scheduled that before they’ve even asked me price. If you’re doing your job right, if you’re laying your packages out properly, and if you have demonstrated that you have something that’s going to meet their needs and solve their problems, oftentimes people don’t care what the price is. Now, that’s not always. Sometimes people are like, “Yeah, that sounds really great Nikki. How much is it?” And then I’m going to answer the question very directly. I’m going to give the answer about what the price is and then say, so I’m going to say if they say, “How much is it to work with you?” I’m going to give them the answer and say, “Is that something you still like to move forward on?” And then I wait. So anytime I’ve given price and issued an invitation, now my job is to zip it. Zip it and wait to see what they say. More than likely if you’ve gotten to that point, they’re going to say yes. If they say no, there are some pieces there that you messed. I might have missed a step somewhere. Now it’s my job to uncover and overcome an objection if that’s the case. I’ve got to ask, I got to be really curious. I’m going to ask some more questions, but more than likely when we’ve gotten to that point, the answer is yes. Then I say, “How would you like to pay for that?” And again, that seems really simple, and it is. Never be afraid of asking somebody how they’d like to pay for that. Then again, you wait. You zip it. Most of the time, they go, “Here’s my credit card,” or, “Can you send me an invoice,” or whatever makes sense with the type of client that you’re working with. That’s beautiful. That was so good. People who really want to dive deeper into selling and really want to know about—whatever we talked about today was great, but it’s just the tip of the iceberg. There is so much more to know and so many delicate nuances that people need to learn from you. I want to finish with two questions. The first one is what are your three top tips to living a stellar life? And three, where can people find you and I also know that you have a gift for our listeners. I do. My three top tips for living a stellar life. One is to only commit to things that make sense for you. Learning how to say no to something so you can say yes, that’s my first tip. The next one is whenever I’m going to do something, my ultimate goal is to make sure that I am satisfied with the results. When I feel satisfied, that gives me such peace of mind. I’m always looking for satisfaction, that doesn’t make sense. What am I trying to say? I’m just always looking to be satisfied. That’s really why I do most of what I do. If I feel satisfied, then I feel like I’ve won in some way. Let’s see, the third tip is really understand your process for recharging and make time for that so that you can show up and be your best self. For me that is I’m super protective of my weekends. I rarely schedule things on weekends because I know that that’s my recharge time and it’s also my time to be with my significant other. We really enjoy our time together. What recharges you and make sure you schedule that into your schedule. The other question was how can people find me was that the question? You can find me through my website which is yoursalesmaven.com and the free gift is a download of one of my books. It’s an ebook on Closing the Sale which will really give scripts and language and the important steps of moving somebody through the closing process. Your audience can get that at yoursalesmaven.com/slp for Stellar Life Podcast. Lovely. Thank you so much, Nikki. That was extraordinary. Thank you, listeners. Go out there, make a difference in the world. Invite people to work with you and enjoy your greatness. Always remember to make your life stellar. ✓ Learn how to adjust your aura and behavior to the crowd so that people can quickly get accustomed and be comfortable with you. ✓ Aim to build rapport with the people around you and really practice on having that intention of getting to know these people personally. ✓ One way to improve a conversation is by paying attention to someone’s rate of speech. It’s difficult to stay in a conversation with somebody who has a significantly different rate of speech than you. ✓ Proactively seek people who are prospective clients through 3-2-1 of networking. The 3 in 3-2-1 is to first build rapport with at least three new people in an event or gathering you’re in. ✓ The 2 is to deepen this rapport with two people not just by giving out your business card or telling them about your website but by genuinely getting to know more about them. ✓ The 1 is to invite a minimum of one person outside of the event. A great way to keep the connection is to make sure you’re in the calendar of the person you’re talking to as this will give you a better venue for discussing business with each other. ✓ Understand that networking is a little bit of a long game and that you have to be willing to keep finding the right group for you. Keep attending events such as masterclasses, conferences and socialgatherings in your industry. ✓ When talking about yourself and what you do, don’t talk about the people you’re trying to help. Instead, describe the kind of people who hire you as this will resonate louder to your potential clients. ✓ Present examples of past works with clients and the results they’ve accomplished with your help. This will serve as your social proof for prospects to realize that you are capable of what you’re talking about. 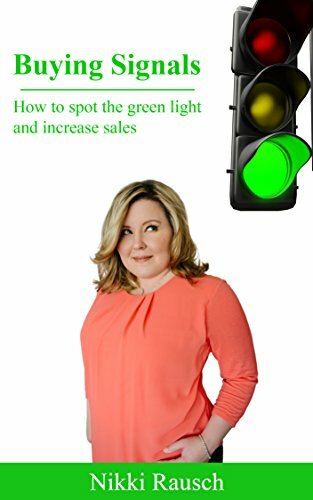 ✓ Grab a copy of Nikki Rausch books Buying Signals: How to Spot the Green Light and Increase Sales and Six-Word Lessons on Influencing with Grace. With 24+ years of experience selling to such prestigious organizations as The Bill & Melinda Gates Foundation, Hewlett-Packard, and NASA, Nikki shattered sales records in many industries, receiving multiple “top producer” awards along the way. An engaging and sought-after speaker, she shares the secrets of her sales success through illuminating keynote addresses and business-changing workshops. Her robust Sticky Selling Master Academy ignites game-changing outcomes for clients, many of whom have also reaped the benefits of her immersive VIP consultations. Nikki’s popular books are available at Amazon. “Buying Signals: How to Spot the Green Light & Increase Your Sales” and “Six-Word Lessons on Influencing with Grace” are excellent resources for those unable to attend her live speaking engagements, coaching groups, or workshops.